It's not my way, it's Wisdom's High Way. Use Wisdom to resolve your problems. Is your life a mess? Perhaps you are in the midst of a self-made calamity. You have tried everything to escape defeat and begin again, yet bad things just keep happening. Your exit route is provided in Wisdom’s High Way through the power of stories that illustrate practical solutions, and Bible teaching. Wisdom’s Highway will help you resolve situations that seem hopeless. If you have found yourself in a prison of your own making, want to avoid making costly decisions, or are just looking for a blueprint for living in wisdom, then Wisdom’s Highway was written just for you. It is for new believers and experienced Christians alike. Our life took an unexpected turn that took us completely by surprise. We sought counsel. Our decisions appeared sound. Yet, everything became a calamity. We desperately tried to put the pieces back together, but every attempt ended in failure. We had to find a better way! So, we dove into the writings of the wisest man to ever live: King Solomon. What we found changed everything; our approach to life, and the decisions we make. The right path is not always easy to find. However, we have a gracious and loving father who has given us the answers. We only need to know where and how to find them. We hope you enjoy our site, and would love to hear your stories, and welcome your comments. 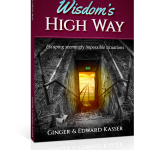 Our book Wisdom's High Way is now available for purchase on Amazon.